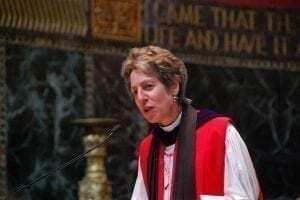 As explained recently by Katherine Jefferts Schori, the presiding bishop of the Episcopal Church, those who deny the science of climate change are both blind and immoral. Jefferts Schori is not only a religious authority, she also has some serious scientific credentials. She holds a doctorate in oceanography and worked as a marine biologist before becoming a priest. Jefferts Schori’s efforts are part of a wave of faith based environmental leadership. Many other faith communities are also involved in climate action and they are doing more than just turning out their lights for Earth Hour. As reported recently in a Global Warming is Real article, led by Pope Francis, Catholics are mobilizing for action on climate change. A large number of faith groups are divesting from fossil fuels because they see divestment as a moral imperative. However, as explained in an interview with The Guardian, Jefferts Schori is not onboard. The Episcopal bishop described action on climate change as a “moral issue”, particularly as it impacts on the poorest and most vulnerable people in the world. She compared climate action to the civil rights movement and she explained that the evangelical community is increasingly involved in activism due in large part to their understanding of climate impacts on the poor. While she acknowledges that some are resistant to climate action for political reasons, she suggested that denial is “immoral” regardless of the motivation. “The Judeo-Christian tradition has always called these motivations sinful,” Jefferts Schori said. “It’s decidedly wrong to use resources that have been given into our collective care in ways that diminish the ability of others to share in abundant life,” she added. Jefferts Schori’s moral leadership is timely as we herald the arrival of spring and prepare to celebrate Easter and Passover. I’m grateful for Bishop Jefferts Schori’s leadership. Unfortunately, I’d have to differ with her position on divestment. As Chris Hayes points out in the referenced article below, ending slavery meant massive economic losses. Would it have been right to lobby from within and continue to profit from investments? Or would that have actually meant a massive loss of moral authority?